I’m onboard a lovely Seabourn ship as guest artist, heading south around the Patagonia and down to Antarctica. I had a smooth trip flying from Seattle to Santiago last week, and was relieved that my checked bags followed me down. One is full of gear and clothing, and the other is full of art supplies! My carry-on pack, dry bag, and hardshell suitcase. I should be set with everything I need! 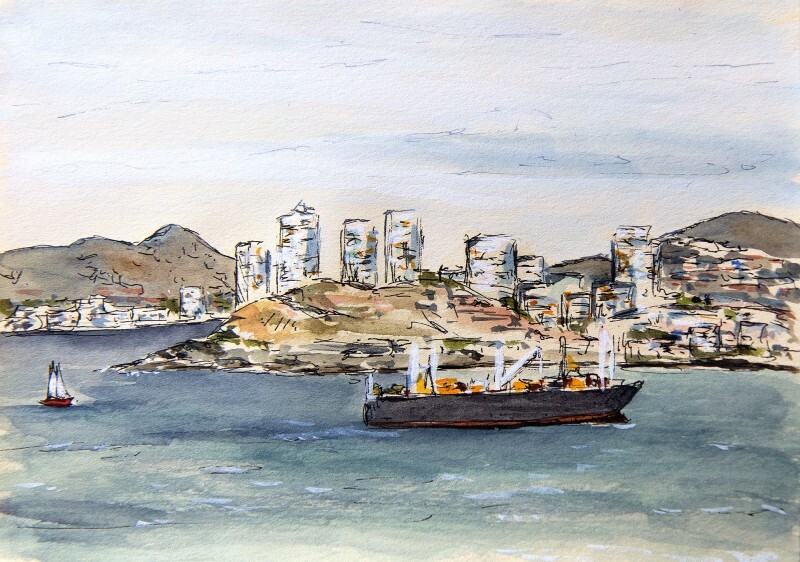 From Santiago, I headed west to the beautiful city of Valparaiso to meet the ship. Valparaiso is an amazing place, recognized as an UNESCO World Heritage Site. I wish I’d had more time there! The colorful buildings stack up along steep hillsides surrounding the harbor and are connected by a labyrinth of narrow streets and pathways. As an alternative to walking, charming funiculars glide up and down the slopes. Before long, it was time to board the ship and leave harbor. Standing ondeck, I rapidly sketched as the city receded into the distance. This is just the beginning of my voyage, please stay tuned for more updates. Happy holidays and I’d love to hear from you! Read the next post, Southern Patagonia by Sea. It’s delightful to hear about your travels! I hope you got a chance to see and enjoy the wide variety of artistic graffiti in Valpo during your brief time there. It’s such a colorful place! Sounds like a fabulous trip. Maria. We visited Chile in 2004 when Sara spent a term at Valpo and lived in Viña del Mar. 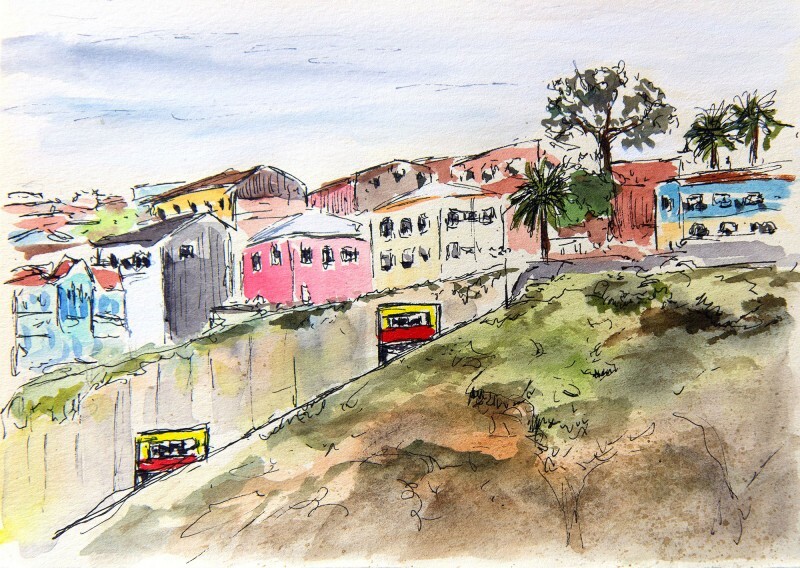 If you’re returning to Valparaíso try to get to at least one of Pablo Neruda’s homes. Sabastiana is in the city; you can get to it via ascensor. Isla Negra (my favorite) is about an hour south. 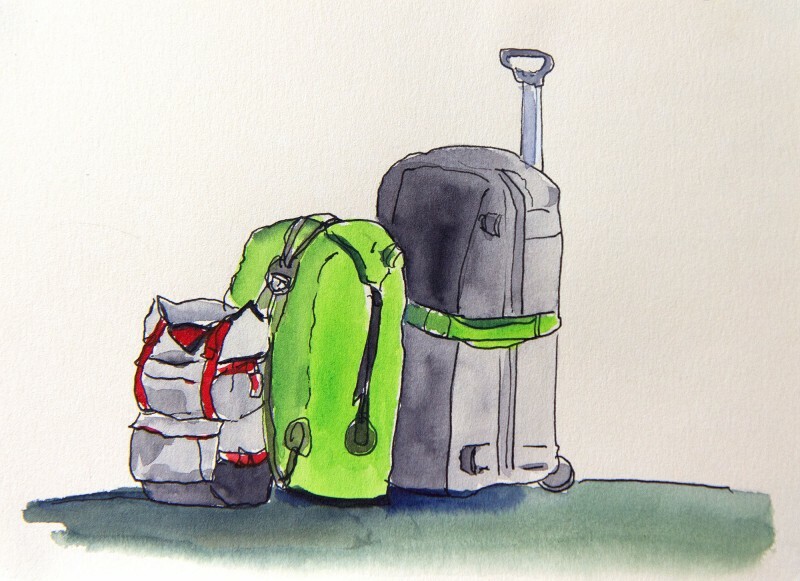 Thanks for sharing your wonderful sketches, happy holiday, and safe travels. Happy New Year, I know Valparaiso well and I am happy I just found your blog. Sounds like an amazing voyage you have embarked on. Looking forward to seeing more of your work.